Was Paul intending for his readers to conjure this picture in their minds in Ephesians 6:10-20? Righteousness shall be the belt of his waist, and faithfulness the belt of his loins (Isa 11:5). How beautiful upon the mountains are the feet of him who brings good news, who publishes peace, who brings good news of happiness, who publishes salvation, who says to Zion, ‘Your God reigns’ (Isa 52:7). The LORD saw it, and it displeased him that there was no justice. He saw that there was no man, and wondered that there was no one to intercede; then his own arm brought him salvation, and his righteousness upheld him. He put on righteousness as a breastplate, and a helmet of salvation on his head; he put on garments of vengeance for clothing, and wrapped himself in zeal as a cloak. According to their deeds so will he repay, wrath to his adversaries, repayment to his enemies; to the coastlands he will render repayment. So they shall fear the name of the LORD from the west, and his glory from the rising sun; for he will come like a rushing stream, which the wind of the LORD drives. ‘And a Redeemer will come to Zion, to those in Jacob who turn from transgression,’ declares the LORD (Isa 59:15b-20). I will greatly rejoice in the LORD; my soul shall exult in my God, for he has clothed me with the garments of salvation; he has covered me with the robe of righteousness… (Isa 61:10). Or both? I think it unlikely that Paul would NOT have had these Isaiah references in mind. Yet he seems to extend the armour imagery beyond them. @Revsimmy I agree that Paul extends the imagery, especially with the shield and the sword. 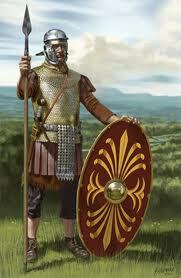 In my opinion, though, the significance of the Roman soldier’s armor is vastly overplayed. Paul certainly could have been looking at a guard outside his prison cell, and if he was that’s probably what drew the Isaiah passage(s) to his mind. But I seriously doubt he wants his readers to believe they should put on armor just like a Roman soldier, ready to fight the satan; rather, it appears to me from the Isaiah reference(s) that Paul is saying, “put on Christ, who is your warrior and has already defeated your enemy.” When we teach or preach the passage as if the Roman soldier’s armor is the primary referent for Paul, it often gives the impression that Paul’s point is for us to arm ourselves to the teeth, instead of being to put on Christ and rely on his already-accomplished victory over evil.